Swedish archaeologists in Jordan led by Professor Peter M. Fischer from the University of Gothenburg have excavated a nearly 60-metre long well-preserved building from 1100 B.C. in the ancient settlement Tell Abu al-Kharaz. The building is from an era characterised by major migration. New finds support the theory that groups of the so-called Sea Peoples emigrated to Tell Abu al-Kharaz. They derive from Southern or Eastern Europe and settled in the Eastern Mediterranean region all the way to the Jordan Valley. Tell Abu al-Kharaz is located in the Jordan Valley close to the border to Israel and the West Bank. It most likely corresponds to the biblical city of Jabesh Gilead. The Swedish Jordan Expedition has explored the city, which was founded 3200 B.C. and lasted for almost 5 000 years. The first excavation took place in 1989 and the most recent in autumn 2013. All in all, 16 excavations have been completed. Peter M. Fischer and his team of archaeologists and students have surveyed an urban settlement that flourished three times over the 5 000 years: around 3100-2900 B.C. (Early Bronze Age), 1600-1300 B.C. (Late Bronze Age) and 1100-700 B.C. (Iron Age). These are the local periods; in Sweden, they occurred much later. Remarkably well-preserved stone structures have been exposed during the excavations. 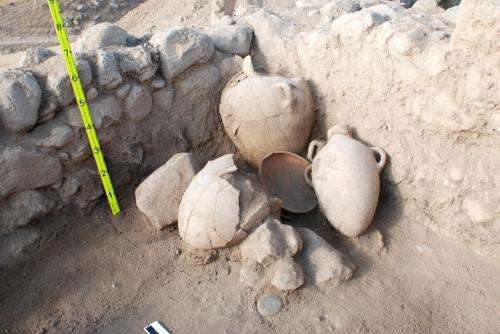 The finds include defensive walls, buildings and thousands of complete objects produced locally or imported from south-east Europe. 'What surprises me the most is that we have found so many objects from far away. This shows that people were very mobile already thousands of years ago,' says Fischer. The scientists have made several sensational finds in the last three years, especially during the excavation of the building from 1100 B.C. where containers still filled with various seeds were found. There are also finds from Middle Egypt that were exported to Tell Abu al-Kharaz as early as 3100 B.C. The exploration of the 60-metre long building discovered in 2010 continued during the most recent excavation. It was originally built in two levels of which the bottom level is still standing with walls reaching 2.5 metres in height after more than 3 000 years. 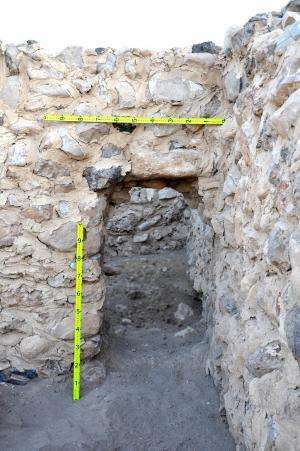 The archaeologists found evidence indicating that the Philistines who lived in the building together with local people around 1100 B.C. utilised a defence structure from 3 000 B.C. in the form of an old city wall by constructing their building on top of it. In this way, they had both easy access to building material and a solid surface to build on. 'One of our conclusions after the excavation is that "Jordanian culture" is clearly a Mediterranean culture even though the country does not border the Mediterranean Sea. There were well-organised societies in the area long before the Egyptian pyramids were built,' says Peter M. Fischer. While I'll admit I'm not much into archaeology, I have never understood why so many people made pots with round bottoms. Did these things sit in baskets or something originally? To pour. Round bottom makes it easier to tip and balance when pouring. Whydening Gyre is correct. You will find that a typical feature of these ancient homes were pits for holding the jars. The rounded end also makes moving a full jar much easier; it can be rolled, instead of needing to be lifted.